U.S. 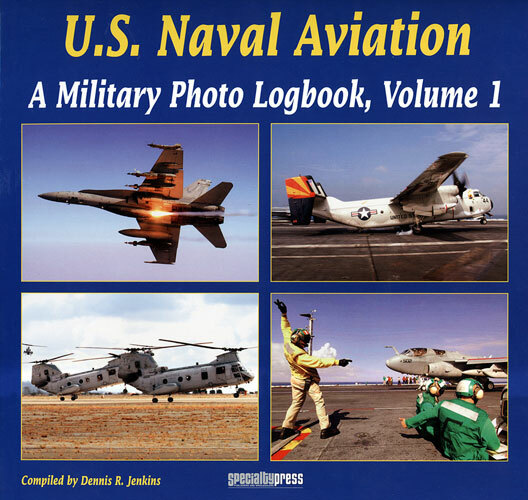 Naval Aviation: A Military Photo Logbook, Volume 1 is the first in a new series of books from Specialty Press. At first glance, the book is reminiscent of the old Osprey Publications Aerospace series of colour photo books which were so welcomed by modellers worldwide for their close-up photography of contemporary military and civilian aircraft. Specialty Press’ concept with these new books is both simple and logical. They span a full year of operations of each of the service that they are covering. In the case of this volume, the title is a bit of a misnomer as there is also coverage of United States Marine Corps aviation and of the United States Coast Guard aircraft and operations as well. All of the images contained in the book have been taken by Service photographers and given this; you are treated with images that no civilian photographer could even hope to capture. Each photograph’s caption includes a full description of the event as well as the date it was taken and this will go a long way to helping you fix an aircraft’s markings in years to come. Pretty well all aspects of operations in peace and war are covered with images captured aboard ships, at U.S. bases across the globe and in the air. Combat operations in Afghanistan and Iraq are included as are humanitarian missions, training exercises, aerial refuelling, aircraft weapons, and maintenance operations. The maintenance shots will be especially welcomed by modellers who are looking for reference to detail their latest masterpiece. All types of U.S. Navy, United States Marine Corps and United States Coast Guard aircraft are covered, including the mighty F-14 Tomcat, the F/A-18 Hornet series, AV8 Harrier, P-3 Orion and the sadly missed S-3 Viking. Rotary wing fans will not be disappointed as coverage of the AH-1 Cobra derivatives, H-53 series, aging CH-46 and the H-60 series are also included. The increasing use of unmanned aerial vehicles by the U.S. military is acknowledged as well and they also receive coverage between the covers. 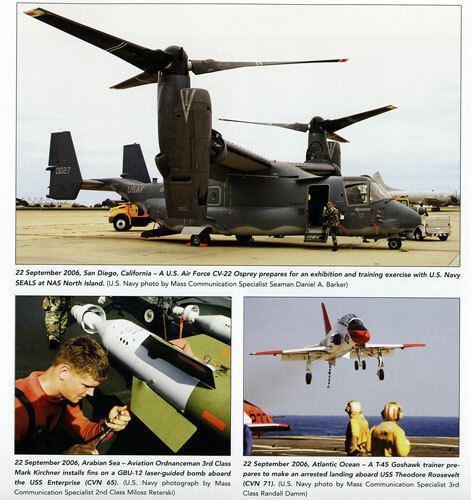 The book it self is soft bound with thin cardboard covers, is 9” x 9” in size (a tad bigger than the Osprey Aerospace series), comprises 120 pages and contains 350 colour photos. As far as I am concerned, these new books from Specialty Press are excellent value. They provide sharp full colour photographs that will delight both the amateur historian as well as the modeller seeking reference shots.